This blog is part four of our seven part HELOC series that will run through March 2019. Please visit the first blog in the series here, and return each month to view our latest addition to the series. You love your home and neighborhood, but you’re bursting at the seams. Remodeling or reorganizing a room won’t be enough to make life more comfortable. You need more space! You need a home addition. Before you launch into this project, you need to figure out how much more space you need, how it will tie into your current floor plan, and how you’ll finance your home addition. We’ve covered the basics on HELOCs (Home Equity Line of Credit) and how to use them to finance a kitchen or bath remodel project. In this fourth part of our series, we focus on adding square footage to your home. While your addition is still a dream, first check your city’s zoning ordinances. The time to learn about property setbacks and height restrictions is before you pour the footings or raise the roof. It’s easier to change your plan on paper than to alter them later. If you’ve been through a remodeling project before, you know that opening up walls can lead to construction woes. Be sure your budget allows for cost overruns to cover the need to update wiring or remove asbestos. With all those unknowns, it’s advisable to rely on professionals to draw up the plans and build your addition. Whether you’re adding a simple sunroom or you’re adding a master bedroom suite, you want your home addition to add value to your home. To add value, you need an addition that isn’t simply tacked on. The floor plan—including the flooring—needs to blend seamlessly with your existing home. And don’t forget the exterior! The goal of a home addition is not only to add space, but also to look like the space has always been part of your home. That means that the exterior needs to blend with the existing structure. Finally, finish your addition with appropriate landscaping. As you work on the construction plan and budget, you do need to know how much financing you qualify for. You don’t want to run out of funds before the room is complete. So while you work out a payment schedule with your contractor, and before you break ground, also get your home addition financing in place. If you aren’t able to borrow as much as you would like, you can scale back the addition accordingly. With plans in hand along with a budget, it’s time to shop for a HELOC. Home equity lines of credit work similar to a credit card and have greater flexibility than a home equity loan. HELOCs are traditionally divided into two phases: a draw period followed by a repayment phase. Your equity is the difference between your home’s purchase price and what you still owe on your mortgage. The market value is also taken into account. Has your home gained value over the time you have lived there? Or has the housing market dropped? Your credit score will also factor in. The better your score, the better the terms and rates you can expect. Because you won’t pay your contractor upfront for the whole cost of your home addition, a HELOC is well suited to financing your project. You draw funds only as needed. What could be more perfect? Of course, there’s always a catch! You will need to repay those funds! Depending on the terms of your repayment phase, you might end up with a higher interest rate than you planned on because HELOC interest rates are variable. Bear in mind that your home is your collateral, so make sure you can repay on time! 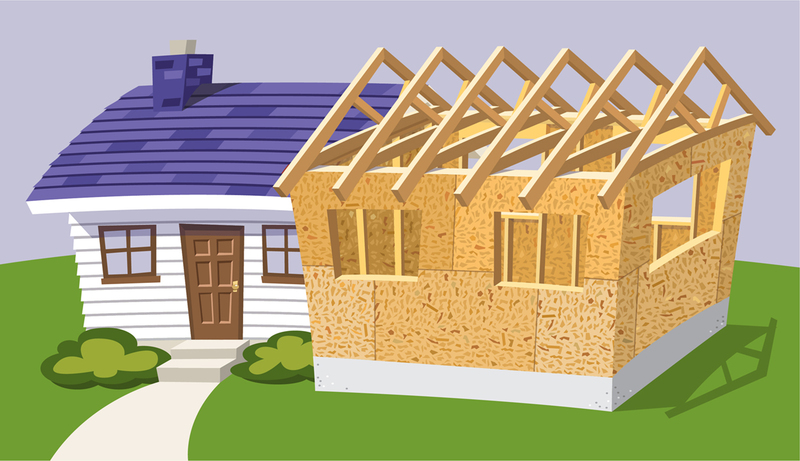 HELOCs are a great match for financing your home addition. Part of the beauty is you won’t have to wait forever for an answer if you do your homework first, including comparison-shopping for the best deals. Then schedule an appointment here at United Financial Credit Union. We’ll answer all your questions and walk you through the process step by step. Typically within two to four weeks, your HELOC will be in place. Before you know it, you’ll be enjoying your new home addition.